CBSE board has announced that this year the student of class 10 and 12 will be able to view their mark sheets online, in the form of Digital Mark sheet. This means that from the year 2016, the mark sheet of the class 10 and 12 board exams will be available in the DigiLocker as well. So basically students can get their mark sheet even without going to their schools, and just download it from the online portal. By making things into digital, it would be easy to track the records and plan wisely for future development. Moreover, digitalization always reduces the burdens like safeguarding the records and information and in fact it offers more security for keeping records much longer time period. In general, experts may point out the digitalization as the revolution in countries development. As far country like India, one of the promising developing countries implementation of digital methods in government works will lay strong foundations for providing better governance. Below listed table elaborates the facts and benefits of transforming official works into digital mode. 1 Making Things Much Easier As government digitalization implemented in all government sectors, it became much easier for common people to get access with the government works. 2 Lesser Documentation As for as government official concern, making Digitalization would benefits them as they won’t need to store and to proper lot of documents for keeping records. 4 Will be Strong foundation for Nation’s Growth Digitalization gives the option for retrieving statistics at anytime and will boost leaders to do effective development modules. 5 Digital Identification With the mode of digitalization, each and every citizen may get digital identification which would be the initiatives for next generation development. A digital mark sheet is a digital version of the mark sheet. The printed mark sheet can be used by the students for their various purposes. The website will be accessible through a username and a password that will be sent by SMS to the students in the mobile number that they have registered with CBSE. Once the student receives the username and password, the student can access their mark sheets from the website. The launch of the website DigiLocker for the students is a government initiative under the Digital India campaign. The DigiLocker will also be available as a mobile phone application and will be available for download on the Google PlayStore. Using this student can check their results and then download their mark sheets from the app itself. The DigiLocker is a website launched by the Government of India and is a protected cloud based platform for the sharing, storing, and verification of the documents and certificated. The website has partnered with the CBSE board so that the results can be published and then the mark sheets could be made easily available to the students who have appeared for the class 12 and 10 exams. Every student of class 10 and 12 appearing for the CBSE board exam will be sent the log in details via SMS in the mobile number that will be registered with the board. 1 What is Digital Mark sheet? Digital Mark sheet is nothing by the electronic version of your exam mark sheets. 3 Benefits of DigiLocker Since separate locker created for individual students, they can access store and access those at anytime and anywhere. Entire process works on basis of cloud computing. Once they have logged in, there will be two options, one for Digital CBSE class 10 Mark Sheet and another for Digital CBSE class 12 Marksheet. Once the option has been chosen, one needs to give their roll number and then the mark sheet will be displayed on the screen, with a download option. The availability of the Digital marksheet is a very helpful initiative that the CBSE and the government of India have collectively taken for the benefit of the students. It has surely made the acquiring of the class 12 and 10 mark sheets very easy. they can simply print it from the official website. Also this will make applying for further studies much easier as most of the applications are now done online. Having a digital marksheet means that the students need not scan their marksheet and then send it for application. They will already have it downloaded. Also even if the student is traveling anywhere, he or she need not carry a physical copy of the marksheet along. Also the marksheet that will be available online will be attested and signed by the concerned authorities. This means that the digital marksheet will be treated at the original marksheet and will have the equal value like the physical marksheet. The students who have appeared for the class 10 and 12 CBSE exams can now easily view and download their mark sheets from the official website and use it for whatever purpose that they want with lot more convenience. 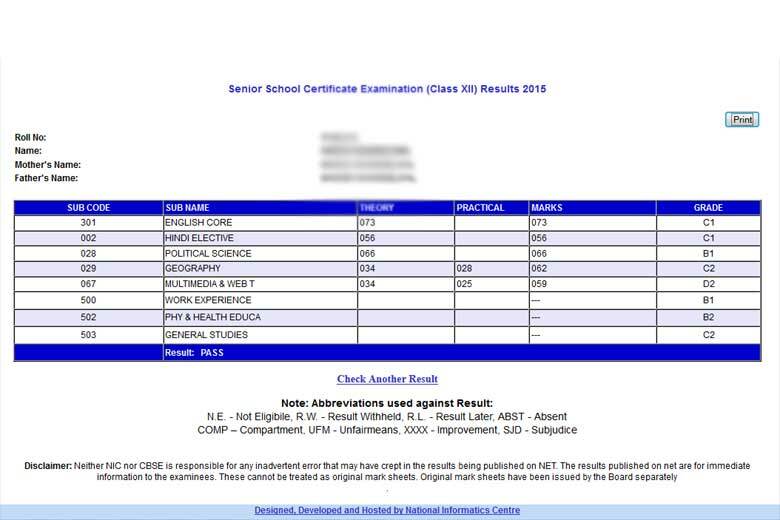 where is serial number written on class 12 marksheet downloaded from digilocker?